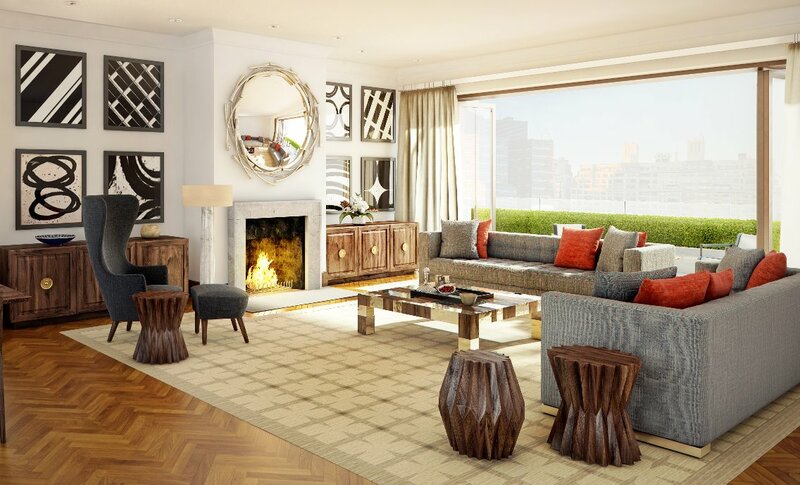 This exceptional full-floor residence elevates indoor and outdoor living in Greenwich Village. Two secured-access elevators open to a private aerie above it all. 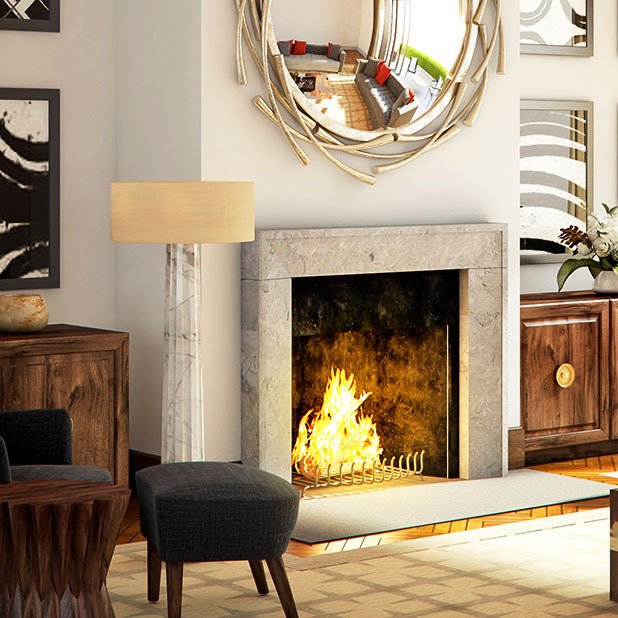 The living room with wood-burning fireplace is paired with a formal dining room leading to an eat-in kitchen. 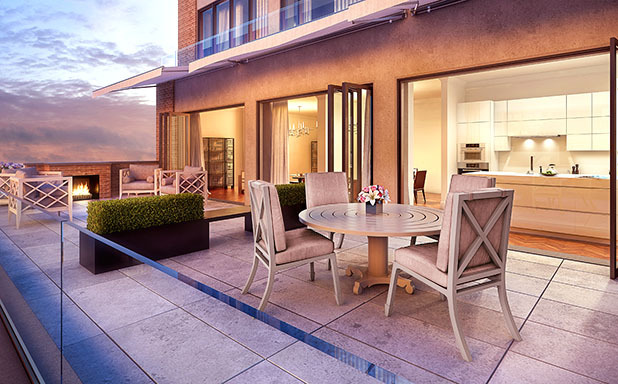 The grand terrace, complete with an outdoor fireplace, is truly one of the most spectacular outdoor great rooms in Manhattan. Noteworthy details include 11-foot ceiling heights, continuous herringbone pattern rift-oak flooring, oversized Panorama windows in excess of seven and a half feet high with automated window shades by Lutron Homeworks, and one deeded private parking space. The twenty-by-forty-eight-foot Grand Terrace is effortlessly integrated into the interior living spaces by NanaWall folding glass walls. These custom walls fold in concertina fashion to create a seamless transition from indoor to outdoor living. The Grand Terrace is finished with custom stone pavers, glass railings, and an outdoor fireplace which adds an extra layer of comfort and refinement to the al fresco dining experience right outside the kitchen. 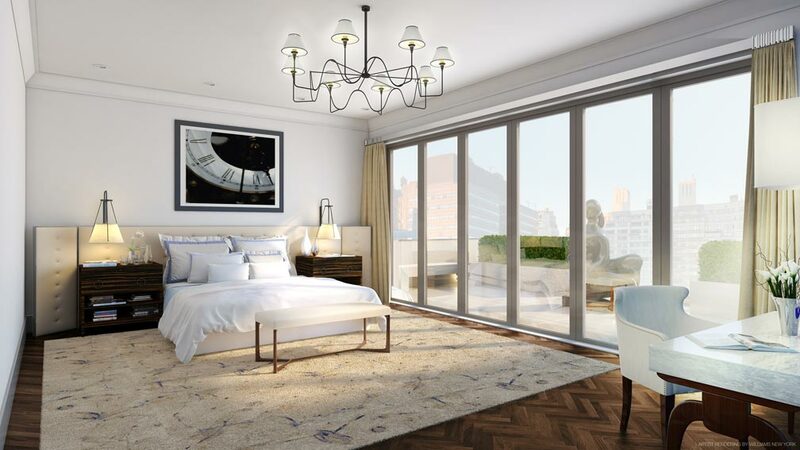 Two additional Union Square Park-facing terraces provide outdoor access for all three bedrooms. Two floors. Three exposures. Four terraces. A peerless four-bedroom penthouse with soarings ceilings up to 11 feet, park views and open cityscapes north to the Empire State Building and south to the Freedom Tower. Leave your private parking space and make your way up to the grand entry that introduces you to this dramatic penthouse residence. Two living spaces, a wood-burning fireplace and Nana glass folding walls open up to magnificent terraces that redefine the indoor / outdoor living experience in Greenwich Village. 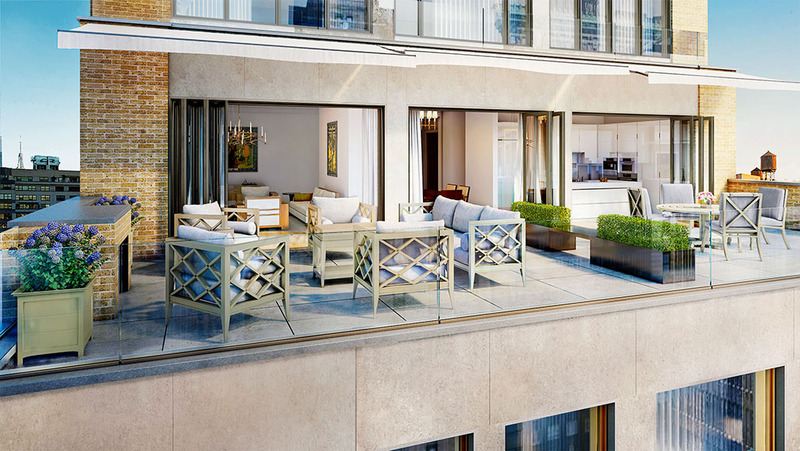 This dramatic and elegant 1,935 square foot entertaining floor is exceptionally proportioned and the three seamlessly integrated outdoor spaces add an additional level of sophistication to the crowning floor of 17 East 12th Street. Sparkling light and gracious open floor plan showcases grand living and dining spaces, complete with two fireplaces, that are ideal for entertaining guests. The exquisitely designed kitchen and family room, complete with fireplace and its own private terrace, have been integrated to create a truly unforgettable experience within the penthouse. Custom-designed for entertaining by Bromley Caldari and created by Poliform Verenna Italia, the master chef kitchen is truly state-of-the-art. Featuring automated touch control cabinetry, a walk-in pantry, preparation islands with built-in cutting boards, and next generation Meile and Sub-Zero appliances including speed and convection ovens, two Miele dishwashers, a glass full-height wine refrigeration holding 147 bottles, warming drawers and a custom coffee system. Double doors open up to the exquisite half floor, 820-square foot master suite, complete with its own private 177 square foot terrace with Nana glass folding walls. This graciously designed master bedroom suite includes two extraordinary walk-in custom fitted Poliform closets and a dual bathroom layout, which overlooks a planting terrace, and is finished with large slabs of Travertine walls, chevron-patterned floors, Dornbracht fixtures and a magnificent glass-encased steam shower. The additional three bedrooms on the residential level of the duplex penthouse each have their own private bathroom and spacious walk-in closet.